The New York Islanders announced today that defenseman Milan Jurcina has agreed to terms on a one-year contract extension. Jurcina, 27, has four points (two goals, two assists) in 19 games with the Islanders this season, while leading the team with a +1 rating. This season, the Islanders are 11-5-3 with Jurcina in the lineup. Originally selected by the Boston Bruins in the 2001 NHL Entry Draft, Jurcina has totaled 57 points (17 goals, 40 assists) in 338 NHL games over seven seasons with Boston, the Washington Capitals, the Columbus Blue Jackets and the Islanders. 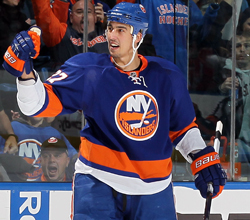 The 6’4”, 240-pound defenseman signed with the Islanders as an unrestricted free agent on Jul 2, 2010. A native of Liptovsky Mikulas, Slovakia, Jurcina represented Slovakia at the 2010 Vancouver Winter Olympic Games.